As competitive as the Great American Beer Festival (GABF) and The World Beer Cup (WBC) are for professional breweries, the number of entrants in those competitions pales in comparison to the 8,172 beers that were judged as part of the 2014 National Homebrew Competition (NHC). That number is almost twice as many as were entered at last year’s GABF (4,809) and this year’s WBC (4,754). The high number of entrants for NHC is made possible due to the fact that there is a first round of regional judging at 12 locations across the country (including Seattle), and then the top entries from those sites move on to the final round of competition, which is held at the National Homebrewers Conference each year. 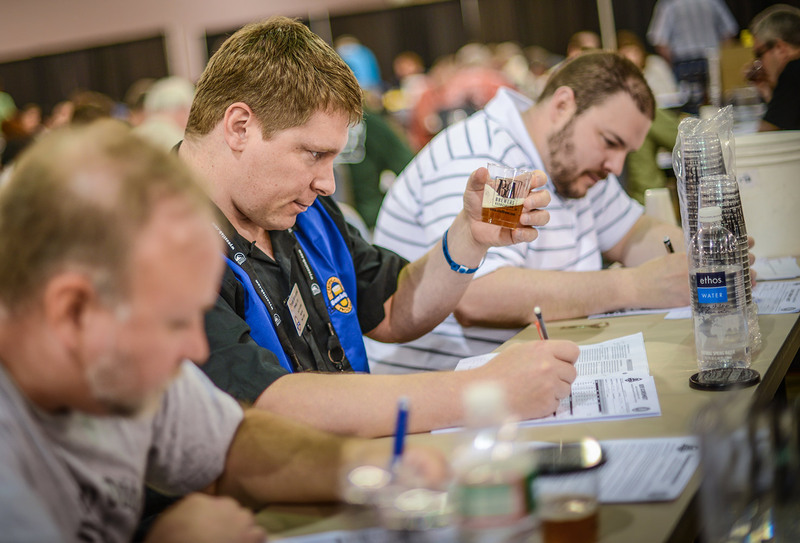 The 2014 conference was held last week in Grand Rapids, MI, and 1,020 entries were judged in the final round by 212 of the country’s top beer judges. Grand Rapids, MI ? June 14, 2014 — The National Homebrew Competition boasted one of the most competitive fields of entries ever, with 8,172 homebrews judged in 2014. The American Homebrewers Association (AHA) awarded the best homebrewers for their efforts at the conclusion of the National Homebrewers Conference, held at DeVos Place in Grand Rapids, Mich.
Robert Hilferding of Zephyrhills, Fla. won the Homebrewer of the Year award with his best-in-show entry in the Scottish and Irish ale category. The Meadmaker of the Year award was presented to Matthew Weide of Minneapolis, Minn. for his melomel, and Edward Walkowski from N. Abington Twp., Pa. won the Cidermaker of the Year award. Jeremy Voeltz was recognized as the winningest homebrewer in the final round with the Ninkasi Award. He hails from Lakeside, Ariz. and brews with the Arizona Society of Homebrewers. Homebrew clubs were also recognized at the award ceremony in Grand Rapids. The Brewing Network narrowly won their fourth Homebrew Club of the Year award—a mere six points separated them from the runner-up, QUAFF. The Gambrinus Club award was given to the Minnesota Home Brewers Association. New for 2014, the Radegast Club of the Year award was presented to the AHA-registered club that made the most exceptional and positive impact on its local community. The Carolina BrewMasters of Charlotte, N.C. earned that honor by developing close connections with their local community through tremendously successful charitable donations, which amounted to $77,500 in 2013. A total of 25 homebrew clubs were nominated for the Radegast award, and then reviewed and voted on by an impartial panel of judges from the AHA Governing Committee and select members of the brewing community. The Carolina BrewMasters will receive a stipend of $500 for the club as well as a $500 donation to the charity of the club’s choice. The American Homebrewers Association has worked on behalf of the homebrewing community since 1978 and celebrates a membership of more than 43,000 homebrewers. The American Homebrewers Association (AHA) organizes events including the National Homebrewers Conference and National Homebrew Competition. The AHA also publishes Zymurgy magazine. The AHA is part of the Brewers Association, whose Brewers Publications division is the largest publisher of contemporary and relevant brewing literature for today’s craft brewers and homebrewers.